With summer in full swing, grilling season is upon us! As you fire up your grill for cookouts and parties with friends and family this season, here are a few of our favorite tips and tricks for grilling with propane. One of the many benefits of grilling with propane is the ease with which you can adjust the temperature of the flame. This versatility makes propane ideal for grilling a wide range of meats and vegetables to perfection. Just make sure you are using the correct temperature for the type of food you are grilling. Sticking to burgers or other thin cuts of meat like pork or lamb? Try a high heat with a quick cook time. Opting for fish, chicken, veggies, or other more delicate foods? Experts suggest using medium heat. If you are grilling a large cut of meat like a roast or an entire chicken, you should stick with a lower temperature with indirect heat. Not sure if your meat is ready to eat? We recommend using a meat thermometer to ensure your meal is properly prepared! We often find ourselves forgetting one of the easiest but most important tips for grilling with propane—keep a close watch on the grill! If you are hosting friends and family for a special event or grilling before the big game, you may be tempted to step away from the grill for a minute to socialize or check on the score. However, remaining present and keeping a close eye on whatever you may be cooking is critical to a delicious end result. If you are grilling with propane and want to spice up your dish with some extra flavor, we suggest adding wood chips into a smoke box to infuse some extra flavor. If you are grilling something with a quick cook time such as fish, stick to dry wood chips. Cooking ribs or chicken on a low heat for a longer period of time? Try a mixture of both dry and water soaked chips. Whenever you grill with propane it is important to keep safety first! 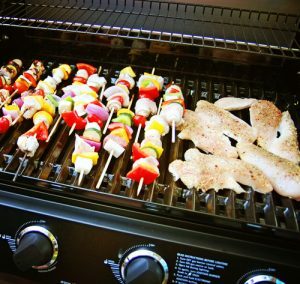 Some key safety items to keep in mind while you grill include always storing propane tanks in an upright position, keeping the grill top open until you are certain the fire is lit and using protective caps or plastic bags to keep disconnected hose-end fittings clean when your grill is not being used. Ensure you Have Enough Fuel! Nothing is worse than firing up the grill before a big barbecue only to realize you are out of propane! We suggest always keeping an extra propane tank on hand for instances like this to ensure you never leave your hungry guests waiting for food while you run out to refill your tank. So what are you waiting for? It’s time to fill up your propane tanks, fire up the grill, and enjoy some summer cookout fun! If you are planning on grilling with propane this season we are here to help. Our propane services are available in Henderson, Bicknell, Livermore, Elkton, Evansville, Dale and the surrounding area. Contact us today to learn more about our residential propane services for cooking and grilling.